Violin shopping is fun, especially when the violin is for someone else and someone else is paying for it. In the last month and a half, I've had fun heping three of my students select a violin at my favotie local luthier. (For my photographs of violins at the luthier's, see my blog of Dec. 12, 2009). My first adventure was with "A," an adult beginner who has been studying the violin with me for about two years. He started with a cheap rental violin, and after a few months bought a good beginner's violin. It sounded wonderful for a little over a year, and then his G string started sounding fuzzy. The more he played, the fuzzier it got. He tried changing the string for another of the same brand and then for another of a different brand, but nothing helped. The sound of the G string got fuzzier and fuzzier. I couldn't understand why, so I posted a question on the v.com discussion board. I got a lot of helpful responses, and the consensus was to sell the violin and get a new one. "A" and I when back to the luthier who had sold him his violin, and the luthier accepted it back in trade. "A" had also accumulated some additional money since buying his first violin, so he was ready to get a higher quality violin. I let him discuss finances with the staff while I admired and photographed violins there. Then a staffer brought out eight violins and three bows for us to try. My student played each violin and then give it to me to play. What I found particularly interesting was that he and I agreed on the sounds of all of the violins. One of them looked ugly to me. It didn't look like varnished wood. It looked like mud. I hoped that it would not sound very good, and it didn't. 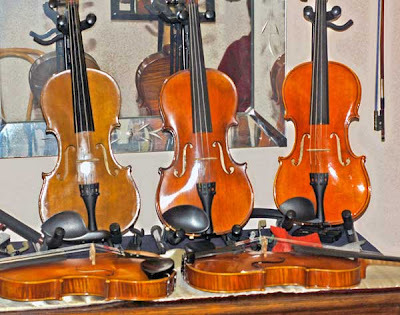 It didn't take long for us to narrow down our selection to five violins. Then we worked hard. We played different kinds of music, each on different strings and different positions on the fingerboard. Again we agreed on everything. When he finally chose the violin he wanted, I wanted it too. I asked him not to buy it now, but to allow me some time to find a wealthy benefactor to buy it for me. That didn't work. Before committing to the violin we both liked the best, I had him try all the violins with each of the three bows we were given: one brazilwood, one Coda diamond, and one JonPaul. I liked the Coda bow the best. It felt light and well balanced in my long hand and weak wrist. My student, however, preferred the JonPaul, and it did play well in his hand. We went back to the first violin that we had turned down, and he played it with the JonPaul bow. It sounded much better, but not as good as our #1 choice. Before we left, "A" asked a staffer whether they had any electric violins he could try. They had two, and we both picked the blue one to try without any amplification. I was surprised that the violin had a soft, but very pleasant, sound. I played it for a while, and then decided that I didn't like it because every note had the same quality of sound. My student, however, liked it quite a bit. The staffer told us that most of the people who bought electronic violins from their store were amateur classical musicians who traveled a lot. The electric violin could be put in a suitcase with clothes around it, and the suitcase could be checked. No hassles with the airplane's staff about taking the violin onboard as a carry-on. When the traveler reached his destination, he could practice quietly in his hotel room. My student loves playing his new violin, and I love listening to him. There are more violin adventure stories to come, so stay tuned.